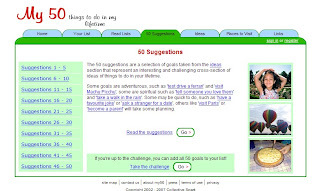 My50 is a online list make site, that encourages people to make a list of the things that they would like to do in their lifetime. You can create your list, add descriptions, pictures and deadlines for each goal you set for yourself. It also has 50 suggestions for anyone. You can set your list "public" or "private", if it is "public", that means you like share it with other people.